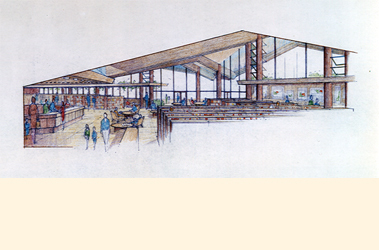 The unexecuted Main Public Library was located to be located in downtown Sausalito and placed within a dramatic site at the water's edge of Richardson Bay with unobstructed views towards San Francisco and the neighboring islands. The plan is a five-sided stretched chevron form with the dominant forward point oriented towards San Francisco to the southeast. The floor is lifted above existing grade by a series of paired pole columns, allowing water to flow below in the event of flood conditions. These same columns extend through the library space to support a broad, spreading roof echoing the plan shape. The deeply overhanging roof hovers above a single continuous space which houses the library collection, creating the open, comfortable feeling of a sheltered pavilion in the outdoors. Floor to ceiling glass fills the two sides which face the bay, allowing for dramatic view opportunity and an extended connection with the environment beyond. The roof is tilted gently upward towards the southeast to allow generous reflected daylighting to fill the volume of space. A trellis at mid-level wraps across the bayside elevation with planting entwined within its openings. From the angled center of this elevation, a terrace projects out towards the water and extends the interior space visually to the outdoors. A departure from conventional library types-- it was the architect's intention for patrons to find these conditions more conducive to browsing for books, then lingering at the furnished lounge for a comfortable afternoon spent reading by the Bay. At the opposite side where the roof approaches grade are the more ancillary support spaces accessed primarily by staff and then the main entry. This streetside elevation is that of a ground-hugging single story building, more pedestrian in scale, scarcely belying the dramatic space which is just beyond. A large multi-purpose room directly adjacent to the main entry was to be available for community use for a variety of local functions. The library project was shelved due to non-passage of public funding bond issue needed to acquire the site. Library and Civic Center were finally housed in a nearby readapted high school building for which Aaron Green Associates were retained to prepare the feasibility and space analysis.